I love working with fresh seasonal produce . 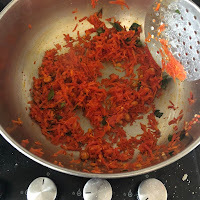 Red carrots and turmeric are in the end of their season, and I made the best use of them in our Sunday Meal. 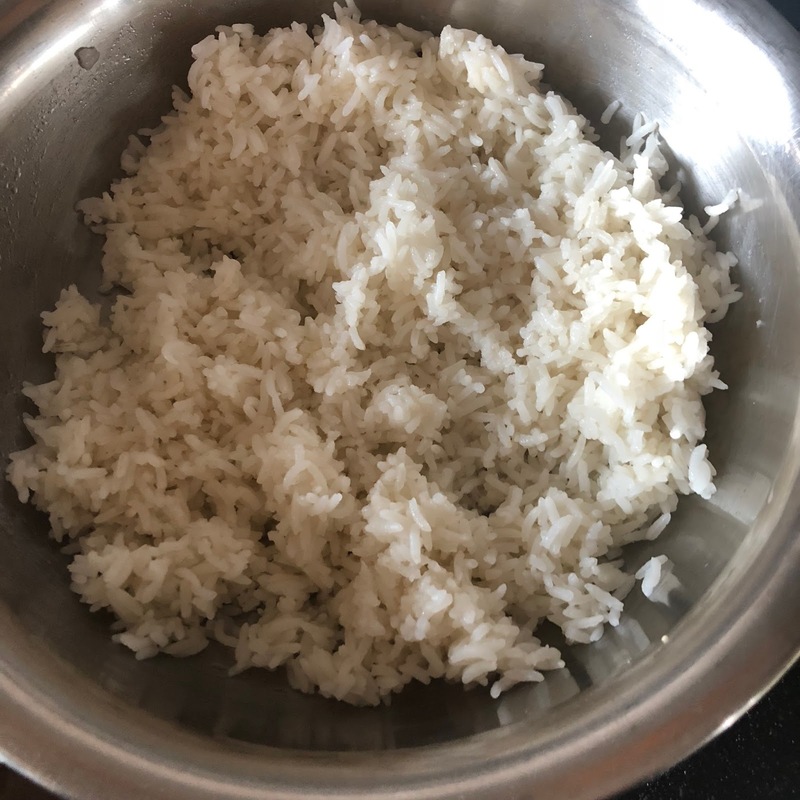 I made a tasty rice variety using them. Fresh turmeric has a strong taste and needs to be handled with care, else, it can completely dominate the dish. 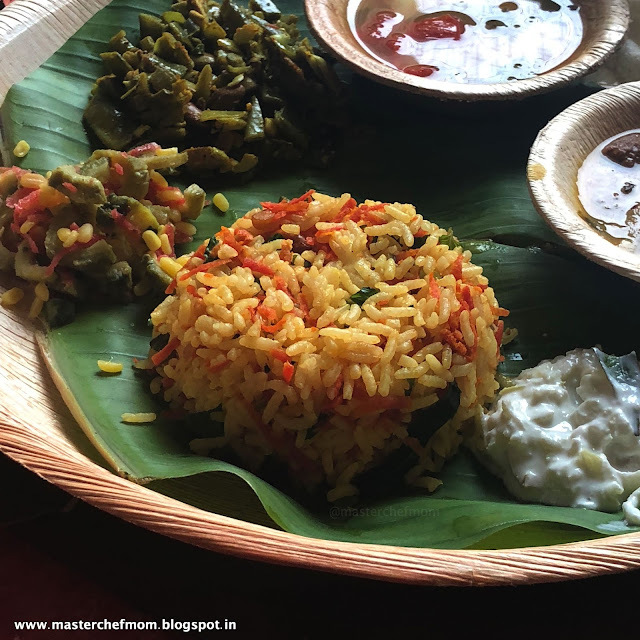 Serving a colourful variety rice makes the meal more interesting. 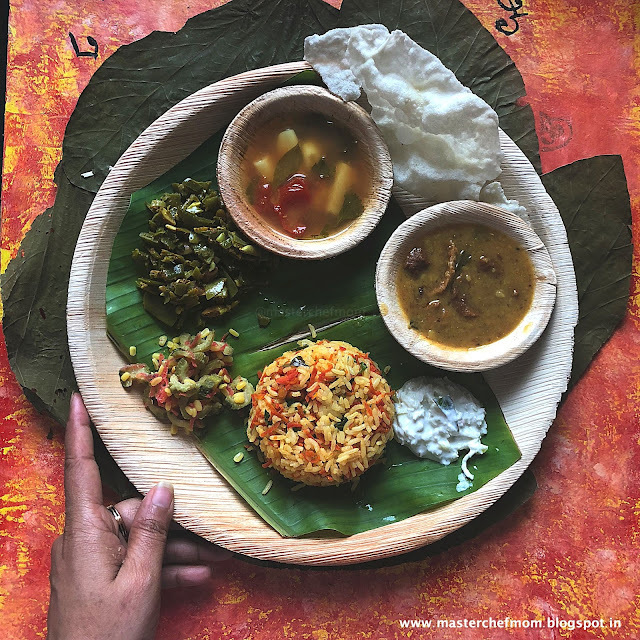 Have you tried my Manjal Sadam and Nellikai Sadam Recipes? 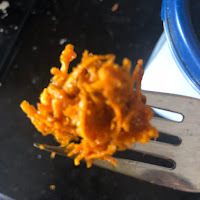 I grated carrot and fresh turmeric. Tempered with mustard seeds, lentils and groundnuts. Mixed in the carrots, turmeric, added salt , freshly ground black pepper and mint leaves. Poured all this over the cooked rice and mixed to coat them evenly. That's it ! 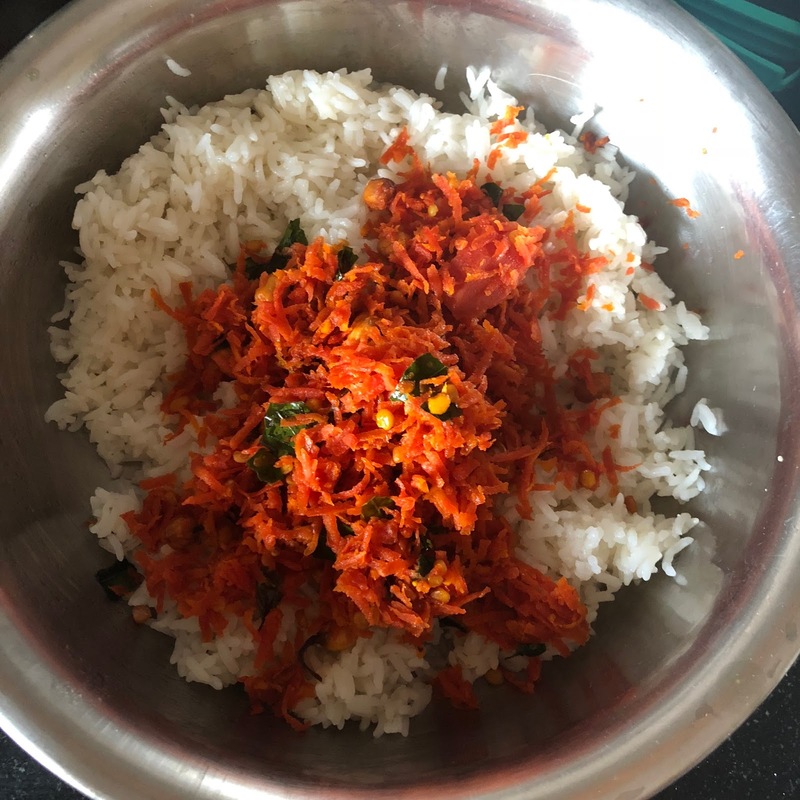 The rice was so delicious and was loved by my family. I wanted to share this recipe with all of you, so that you can try and cook it for your family and friends. A fuss free rice that can even be packed for lunch box. I added black pepper for spice and when paired with a raita, it makes a complete meal. Of course, if you like spice, you can add green or red chillies while tempering . I might be repeating myself, but indeed 'Simple recipes are the tastiest'. Along with this Carrot turmeric rice, I served, Amla curd Salad ( similar to Nellikai Pachadi) , Bitter gourd salad, Lima beans poriyal ( similar to this Beetroot poriyal ), Garlic Rasam and Karuvadam/urad vadi sambar . 1. Spread the cooked rice in a wide bowl . Chef tip : This is to avoid the rice becoming mushy. 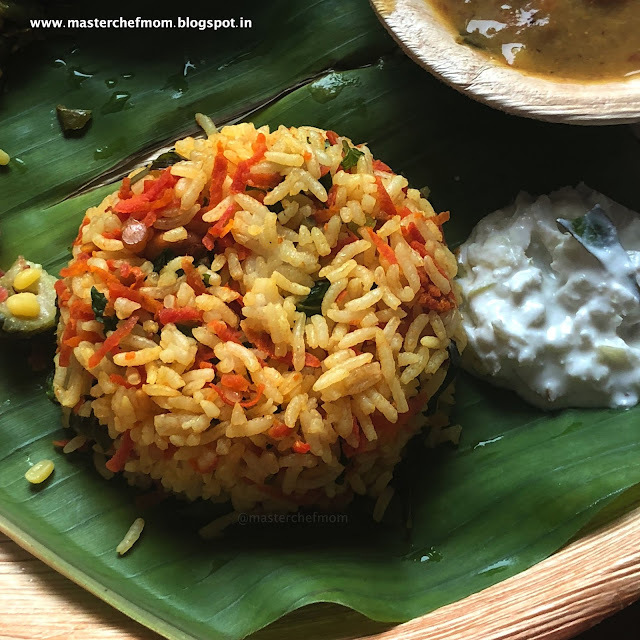 You can drizzle 1/2 teaspoon rice and mix well for more flavour. 2. Heat a wide pan with oil and temper with ingredients given for the same. 3. Add the carrot and fresh turmeric. Chef tip : Grate the vegetables just before you make this rice for maximum flavour. 4. Cook over low flame for 2-3 minutes only. 5. Add salt, crushed peppercorns , mint leaves , mix and switch off. 6. Pour this mixture over the rice . Your delicious Carrot Turmeric rice is now ready !